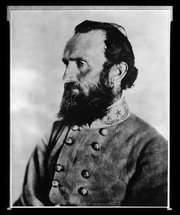 Thomas Jonathan "Stonewall" Jackson (January 21, 1824 – May 10, 1863) was an American teacher and soldier. He became a famous Confederate general during the American Civil War, and was killed midway through the conflict. Jackson is often considered one of the most gifted battlefield commanders in American history, and his death was a severe setback for the Confederacy. Thomas Jonathan Jackson was a great-grandson of John Jackson (c. 1715 – September 25, 1801) and his wife Elizabeth Cummins. John was born in Coleraine, County Londonderry, Kingdom of Ireland. He emigrated to the Province of Maryland in 1748 and moved to the Colony and Dominion of Virginia in 1758. He participated in the American Revolutionary War, notably fighting in the Battle of Kings Mountain (October 7, 1780). He was a lieutenant of the Virginia Militia since 1787. Elizabeth was born in London and raised by an unwed aunt. She was the only heir of said aunt and inherited one thousand pounds sterling. She emigrated to Maryland on her own and later used her inheritance to acquire 3,000 acres of land. She is said to have successfully defended her land from attacks by Indians. They were parents of eight children. Their second son Edward Jackson (March 1, 1759 – December 25, 1828) was married twice. He and his first wife Mary Haddan were parents to six children. He and his second wife Elizabeth Weatherholt Brake were parents to an additional nine children. Jonathan Jackson was his third son by his first marriage. Jackson was the third child of Julia Beckwith (née Neale) Jackson (1789–1831) and Jonathan Jackson (1790–1826), an attorney. Both of Jackson's parents were natives of Virginia. The family already had two young children and were living in Clarksburg, in what is now West Virginia, when Thomas, their third son, was born. Two years later, tragedy struck the family when Jackson's father and sister Elizabeth (age six) died of typhoid fever. Jackson's mother gave birth to Thomas's sister Laura Ann the next day. Julia Jackson was widowed at 28 and was left with much debt, selling all the family's possessions to pay them. She declined family charity and moved into a small one-room house. Julia took in sewing and taught school to support herself and her three young children for about four years. In 1830, she remarried, but her new husband, also an attorney, did not like his stepchildren, and there were continuing financial problems. Then, after giving birth to Thomas's half-brother, she died of complications, leaving her three children orphaned. Julia was buried in an unmarked grave in a homemade coffin in Ansted, West Virginia. Jackson was seven when his mother died, and he and his sister Laura Ann were sent to live with their paternal uncle, Cummins Jackson, who owned a grist mill in Jackson's Mill (near present-day Weston near Pittsburgh). Cummins Jackson was strict to Thomas Jackson, often giving his own views on things. Thomas Jackson looked up to Cummins as a schoolteacher. His older brother, Warren, went to live with other relatives on his mother's side of the family, but he died of tuberculosis in 1841 at the age of 20. Jackson helped around his uncle's farm, tending sheep with the assistance of a sheepdog, driving teams of oxen and helping harvest the fields of wheat and corn. Formal education was not easily obtained, but he attended school when and where he could. Much of Jackson's education was self-taught. He would often sit up at night reading by the flickering light of burning pine knots. The story is told that Thomas once made a deal with one of his uncle's slaves to provide him with pine knots in exchange for reading lessons. This was in violation of a law in Virginia at that time that forbade teaching a slave to read or write, but nevertheless, Jackson taught the man as promised. In his later years at Jackson's Mill, Thomas was a schoolteacher. In 1842, Jackson was appointed to the United States Military Academy at West Point, New York. Because of his inadequate schooling, he had difficulty with the entrance examinations. As a student, he had to work several times harder than most cadets to absorb lessons. However, displaying a dogged determination that was to characterize his life, he became one of the hardest working cadets in the academy. Thomas Jackson graduated 17th out of 59 students in the Class of 1846. Jackson began his U.S. Army career in the 1st U.S. Artillery Regiment and was sent to fight in the Mexican War from 1846 to 1848. Again, his unusual character emerged. When he refused what he felt was a "bad order" to withdraw his troops, he was confronted by a superior officer. He explained his rationale and claimed that, with only 50 more troops, he could persevere and win the particular situation. His judgment proved correct, earning him field promotion to the brevet rank of major. He served at the Siege of Veracruz and the battles of Contreras, Chapultepec, and Mexico City, eventually earning two brevet promotions. While serving in Mexico, Jackson first met Robert E. Lee. In the spring of 1851, Thomas Jackson accepted a newly created position to teach at the Virginia Military Institute (VMI), in Lexington, Virginia. He became Professor of Natural and Experimental Philosophy and Instructor of Artillery. Jackson's teachings are still used at VMI today because they are military essentials that are timeless, to wit: discipline, mobility, assessing the enemy's strength and intentions while attempting to conceal your own, and the efficacy of artillery combined with infantry in a literal combined attack. However, despite the quality of his work, he was not popular as a teacher. The students mocked his apparently stern, religious nature and his eccentric traits. Little as he was known to the white inhabitants of Lexington, he was revered by the slaves, to whom he showed uniform kindness, and for whose moral instruction he worked unceasingly. During this time Jackson even began a Sunday school for blacks, both slave and free. While an instructor at VMI, in 1853, Thomas Jackson married Elinor "Ellie" Junkin, whose father was president of Washington College in Lexington. A son was born to them but unfortunately, Ellie died during childbirth and the newborn child died immediately following the birth. After a tour of Europe, in 1857, Jackson married again. Mary Anna Morrison was from North Carolina, where her father was the first president of Davidson University. They had a daughter named Mary Graham on April 30, 1858, but the baby died less than a month later. Another daughter was born in 1862, shortly before her famous father's death. The Jacksons named her Julia Laura, after his mother and sister. In November 1859, at the request of the governor of Virginia, Major William Gilham led a contingent of the VMI Cadet Corps to Charles Town to provide an additional military presence at the execution by hanging on December 2, 1859 of militant abolitionist John Brown following his raid on the federal arsenal at Harpers Ferry. Major Jackson was placed in command of the artillery, consisting of two howitzers manned by 21 cadets. In 1861, as the American Civil War broke out, Jackson became a drill master for some of the many new recruits in the Confederate Army. On April 27, 1861, Virginia Governor John Letcher ordered Colonel Jackson to take command at Harpers Ferry, where he would assemble and command the famous "Stonewall Brigade", consisting of the 2nd, 4th, 5th, 27th, and 33rd Virginia infantry regiments. All of these units were from the Shenandoah Valley region of Virginia. He was promoted to brigadier general on June 17. Jackson rose to prominence and earned his nickname after the first battle of Bull Run (known as the First Battle of Manassas in the South) in July 1861, when Brigadier General Barnard E. Bee exhorted his own troops to reform by shouting, "There stands Jackson like a stone wall. Rally behind the Virginians!" Jackson was quickly promoted to divisional command. There is some controversy over Bee's statement and intent. At the time during the battle Jackson and his command were not engaged in the battle and some intrepret the comment to have meant that Jackson was not moving (into the battle as Bee felt he should have been) and the comment was meant to be more a criticism than a compliment. Bee did not have an opportunity to clarify the matter as he was killed in the battle. In May and June of 1862, he was given an independent command in the Shenandoah Valley. There he soundly thrashed the Union forces by a combination of great audacity, excellent knowledge and shrewd use of the terrain (including the Valley Pike and gaps in the Blue Ridge), and the ability to inspire his troops to great feats of marching and fighting. With fewer than 17,000 men, he defeated 60,000 Union troops through a series of lightning marches and brilliant battles. Stonewall Jackson's reputation for moving his troops earned them the nickname "foot cavalry". In the spring of 1862, Union General George B. McClellan led the Peninsula Campaign, a major advance from Hampton Roads at Fort Monroe up the Virginia Peninsula between the York and James Rivers. Union forces reached the defenses of Richmond on June 1. After the campaign in the Shenandoah Valley ended in mid-June, Jackson and his troops were called to the defense of Richmond, Virginia. By utilizing a railroad tunnel under the Blue Ridge Mountains and then transporting troops to Hanover County on the Virginia Central Railroad, Jackson and his forces made a surprise appearance in front of McClellan at Mechanicsville. Reports had last placed Jackson's forces in the Shenandoah Valley; their presence near Richmond added greatly to the Union commander's overestimation of the strength and numbers of the forces before him. This proved a crucial factor in McClellan's decision to re-establish his base at a point many miles downstream from Richmond on the James River at Harrison's Landing, essentially a retreat that ended the Peninsula Campaign and prolonged the war almost three more years. Jackson's troops served well under Robert E. Lee in the series of battles known as the Seven Days Battles, but Jackson's own performance in those battles is generally considered to be lackluster. The reasons are disputed, although a severe lack of sleep after the grueling march and railroad trip from the Shenandoah Valley was probably a significant factor. Both Jackson and his troops were completely exhausted. Jackson was now a corps commander under Lee. At the Second Battle of Bull Run (or the Second Battle of Manassas in the South), he made an aggressive flanking march that seized a supply depot in the Union rear, provoking an attack from Maj. Gen. John Pope. Pope's army was defeated and retreated to Washington, another Union defeat on the same ground as in 1861. When Lee decided to invade the North in the Maryland Campaign, Jackson took Harpers Ferry, then hastened to join the rest of the army at Sharpsburg, Maryland, where they fought McClellan in the Battle of Antietam. The Confederate forces held their position, but the battle was extremely bloody for both sides, and Lee withdrew the Army of Northern Virginia back across the Potomac River, ending the invasion. Jackson's troops held off a ferocious Union assault at the Battle of Fredericksburg. At the Battle of Chancellorsville, Jackson's forces flanked the Union army, and in an intense battle deep in the tangled woods drove them back from their lines. Darkness ended the assault. As Jackson and his staff were returning to camp on May 2, they were mistaken for a Union cavalry force by their own troops and fired upon. Jackson was hit by three bullets; his left arm had to be amputated by Dr. Hunter McGuire, and he died on May 10 of pneumonia. Jackson's dying words: "Let us cross over the river and rest in the shade of the trees". Upon hearing of Jackson's death, Robert E. Lee mourned the loss of both a friend and a trusted commander. The night Lee learned of Jackson's death, he told his cook, "William, I have lost my right arm" (deliberately in contrast to Jackson's left arm) and "I'm bleeding at the heart." Jackson is considered one of the great characters of the Civil War. He was profoundly religious, a deacon in the Presbyterian Church. He disliked fighting on Sunday, though that did not stop him from doing so. He loved his wife very much and sent her tender letters. In command, Jackson was extremely secretive about his plans and extremely punctilious about military discipline. He generally wore old, worn-out clothes rather than a fancy uniform, and often looked more like a moth-eaten private than a corps commander. In contrast to Lee, he was not a striking figure, particularly since he was not a good horseman and, therefore, rode a staid, dependable horse, rather than a spirited stallion. A recurring story concerns his love of lemons, which he allegedly gnawed whole to alleviate symptoms of dyspepsia. However, recent research has found that none of his contemporaries recorded any unusual lemon habits and Jackson thought of a lemon as a "rare treat ... enjoyed greatly whenever it could obtained from the enemy's camp". He was fond of all fruits, particularly peaches. He held a lifelong belief that one of his arms was longer than the other, and thus usually held the "longer" arm up to equalize his circulation. He was described as a "champion sleeper", even falling asleep with food in his mouth occasionally. He also became noted throughout the Confederate Army for leading his troops in complete circles. The South mourned his death; he was greatly admired there. Many theorists through the years have postulated that if Jackson had lived, Lee might have prevailed at Gettysburg. Certainly Jackson's iron discipline and brilliant tactical sense were sorely missed, and might well have carried an extremely close-fought battle. He is buried at Lexington, Virginia, near VMI, in the Stonewall Jackson Memorial Cemetery. He is memorialized on Georgia's Stone Mountain, in Richmond on historic Monument Avenue, and in many other places. After the War, his wife and young daughter Julia moved from Lexington to North Carolina. Mary Anna Jackson wrote two books about her husband's life, including some of his letters. She never remarried, and was known as the "Widow of the Confederacy", living until 1915. His daughter Julia married, and bore children, but she died of typhoid fever at the age of 26 years. A former Confederate soldier who admired Jackson, Captain Thomas R. Ranson of Staunton, Virginia, also remembered the tragic life of Jackson's mother. Years after the War, he went to the tiny mountain hamlet of Ansted in Fayette County, West Virginia, and had a marble marker placed over the unmarked grave of Julia Neale Jackson in Westlake Cemetery, to make sure that the site was not lost forever. West Virginia's Stonewall Jackson State Park is named in his honor. Nearby, at Stonewall Jackson's historical childhood home, his Uncle's grist mill is the centerpiece of a historical site at the Jackson's Mill Center for Lifelong Learning and State 4-H Camp. The facility, located near Weston, serves as a special campus for West Virginia University and the WVU Extension Service. The United States Navy submarine U.S.S. Stonewall Jackson (SSBN 634), commissioned in 1964, was named for him. The words "Strength—Mobility" are emblazoned on the ship's banner, words taken from letters written by General Jackson. It was the third U.S. Navy ship named for him. The submarine was decommissioned in 1995.